Mr. Reese, Puzzles, Enigmas, and Conundrums: Random Sketchbook Drawings while singing Karaoke and watching a "Let's Play" of Xenogears. Random Sketchbook Drawings while singing Karaoke and watching a "Let's Play" of Xenogears. Several drawings I made in between singing Karaoke/watching my roommates do a "Let's Play" of Xenogears. Drawn while watching Xenogears. Loosely based on one of the female characters. Drawn in between singing Karaoke. 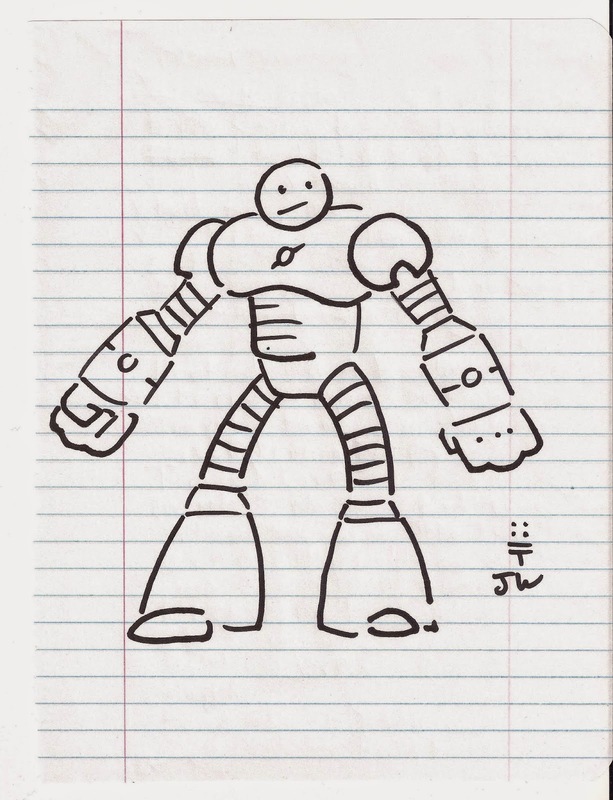 I was just trying to draw a robot guy, but someone pointed out that this guy looks like the robot character, Baymax, from "Big Hero Six." I musta just watched the trailer or sumthin' and had him on the brain. Drawn while watching Xenogears. 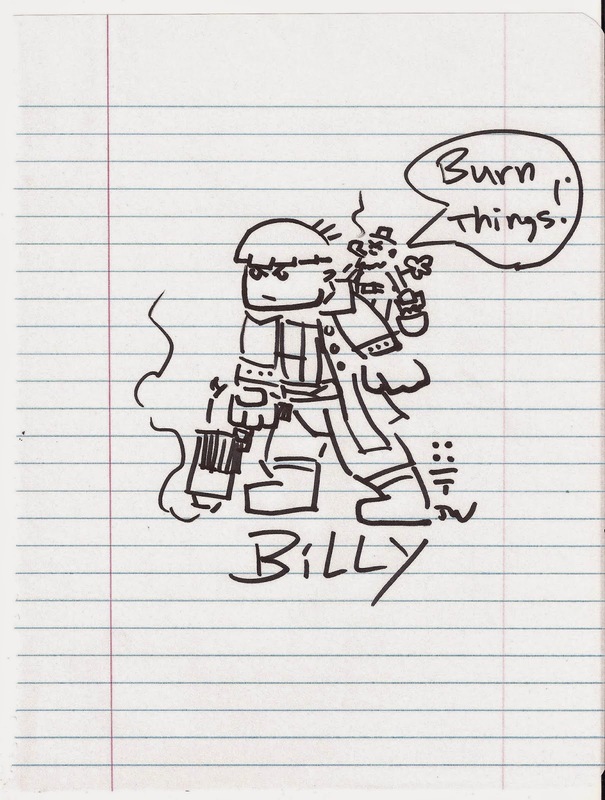 Based on the character, "Billy." I added the leprechaun to tell him to burn things. Drawn while watching Xenogears. 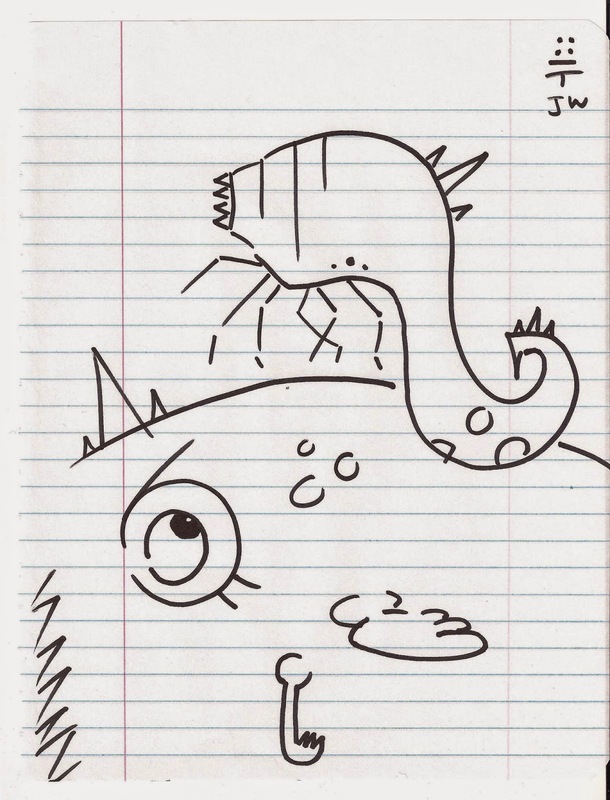 One of the "Croaker" frog monsters you fight in the game. 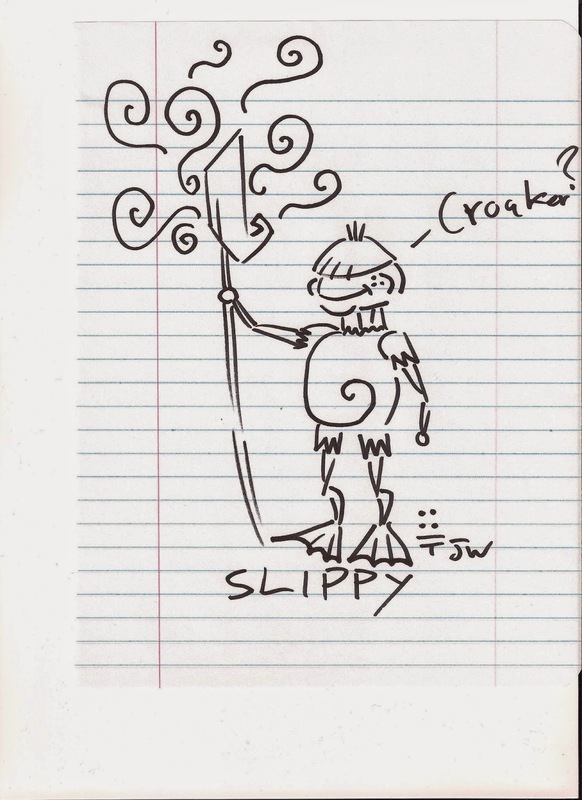 I named him "Slippy." A reference to the Nintendo game, Star Fox. Drawn while watching Xenogears. 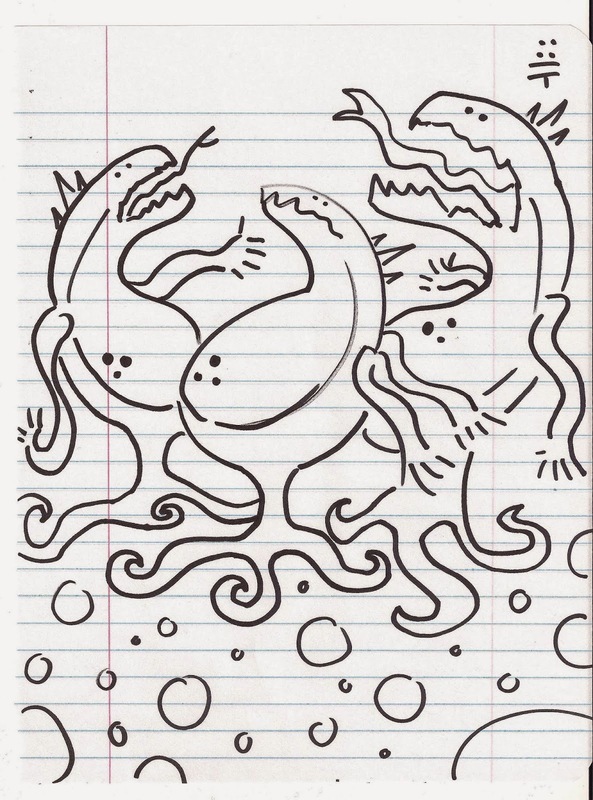 Based on some weird eggplant-looking monsters. I made them into a trio. They might sing a song for you. Or eat your face. Drawn while watching Xenogears. 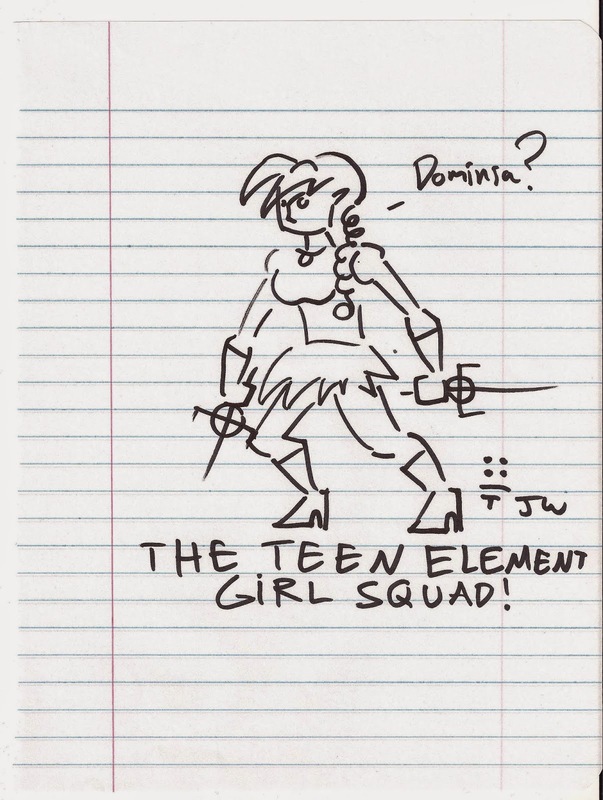 Dominia from what we dubbed the "Teen Element Girl Squad!" Drawn while watching Xenogears. Based on a random monster. 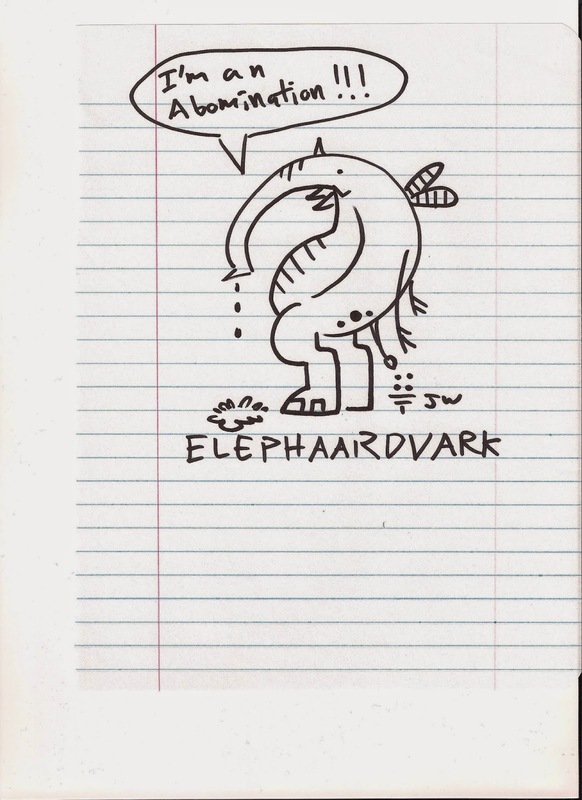 I called it an "Elephaardvark." It calls itself an abomination. Drawn in between singing Karaoke. 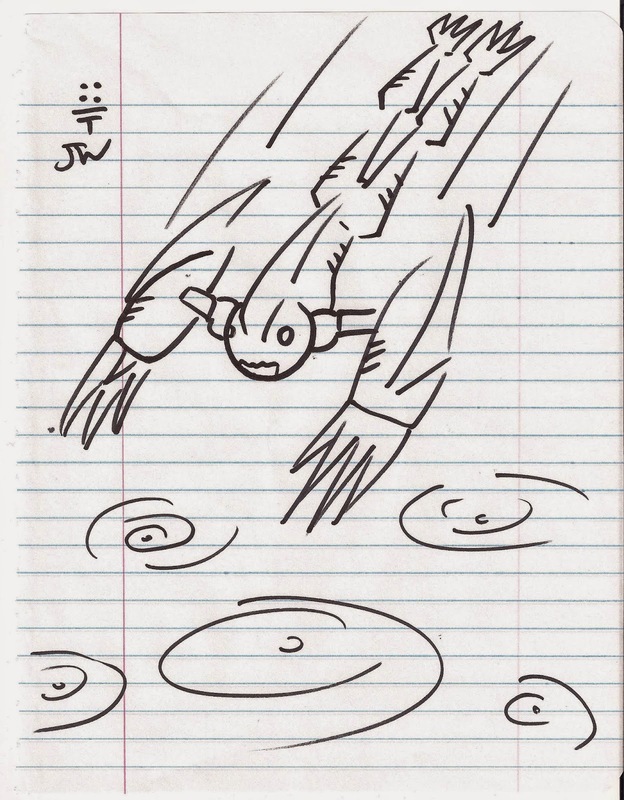 Loosely based on the Zora mer-people from The Legend of Zelda. Drawn while watching Xenogears. 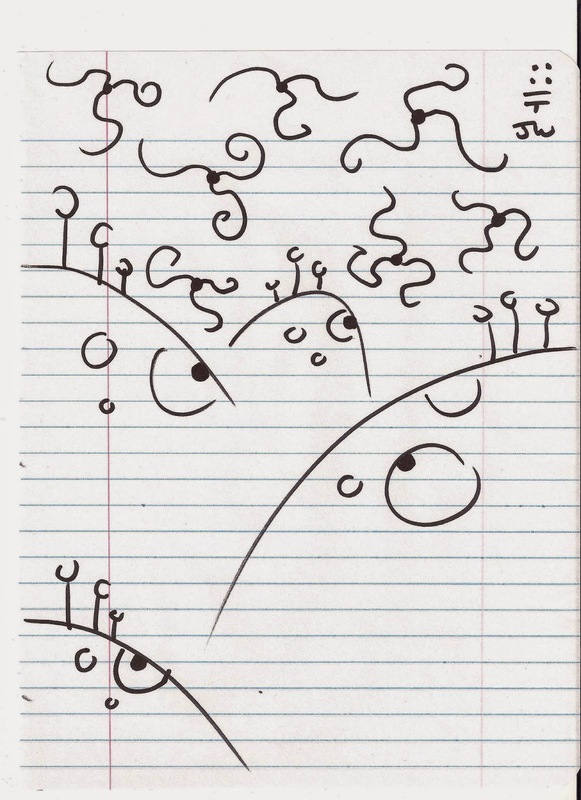 Weird hills with eyes and flying tadpoles with three tails. Bizarre. Drawn while watching Xenogears. Based on one of the monsters that reminded me of a Remora - a type of parasitic worm. Also, it's sitting on the head of another monster. Drawn while watching Xenogears. 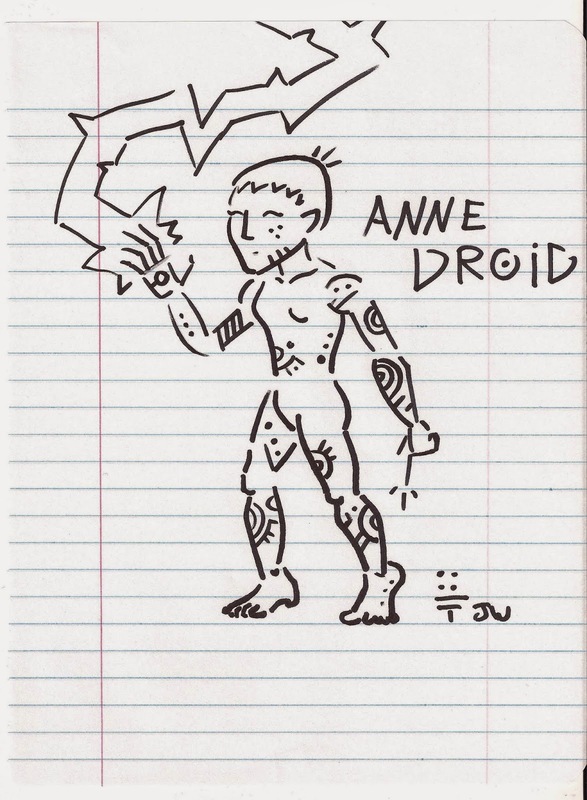 Based on of the robots you encounter in the game. 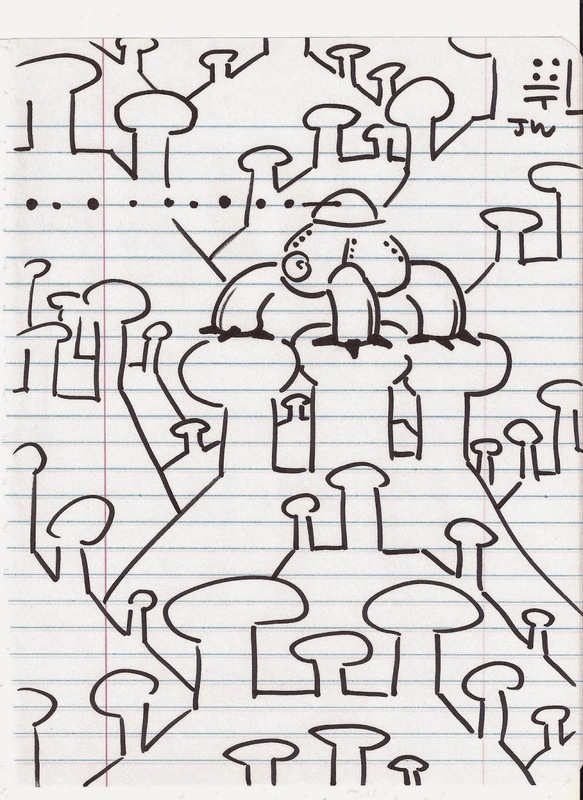 This one likes to hang out in the Mushroom Kingdom, apparently. Drawn while watching Xenogears. 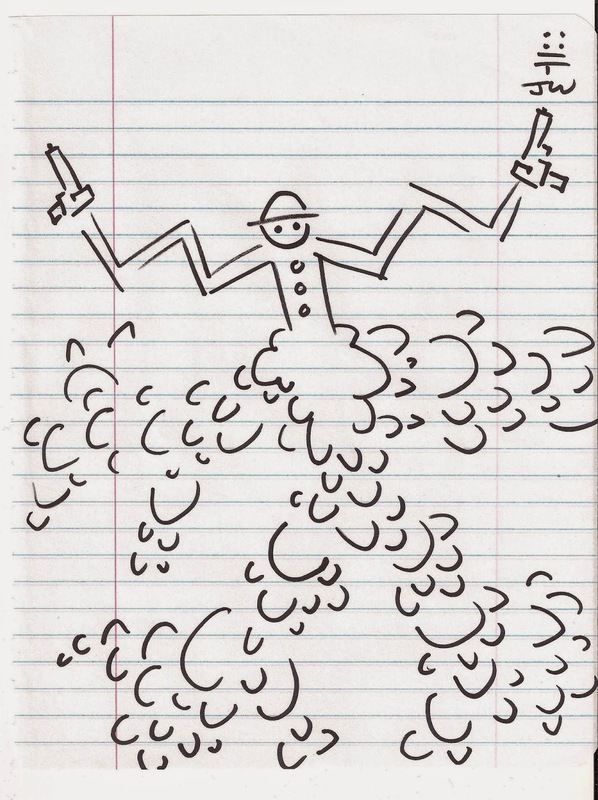 A crime-fighting genie character I came up with in junior high.